I honestly can't remember the last time a book had such an emotional impact on me. The Happiest Refugee constantly had me alternating between laughing out loud and being on the verge of tears. I almost didn't read it. 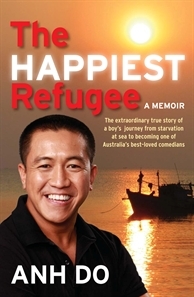 I'd seen Anh Do on TV occasionally, but never particularly followed his comedy or had any particular interest in him. Also, I don't do memoirs. I tried to read The Long Way Home once upon a time but even the embiggening story of Nelson Mandela couldn't catch my fiction fancy. However, one day I read a positive book review about The Happiest Refugee, so with a Borders gift card in hand, I toddled over and bought it. Little did I know it would be the best $34 I would spend on a book in all of 2010. It's not exactly a literary tour de force - sometimes there are awkward turns of phrases that highlight the fact that the author is a comedian, not a writer by nature - but it's an absolutely compelling read. Through anecdotes and smaller bite-sized stories of a larger whole, Do tells us about his family's harrowing escape from Vietnam, the struggles of their early arrival in Australia and the career that took him into the loungerooms of families across the country. When you read the book, you understand the reason for his success. Do is revealed through every word and every page as someone with good sense, keen humour, high intelligence, a lot of determination and even more gratitude. It's an uplifting and positive read that celebrates the richness of life, rather than dwelling on the poor-me aspect that many memoirs tend to do. Through the funny stories and anecdotes, we're told about the enormity of his love and respect for his mother, his struggles with and ultimate forgiveness for an absent and alcohol-abusive father, and the mark they left on this young Vietnamese boy who would grow up with a never-say-die outlook on the world interpreted through a humorous eye. Not only is The Happiest Refugee funny and touching, it's also full of (dare I say it) immigrant wisdom. It reminded me of moments when I was growing up, like my dad looking sadly at the vandalism of a public train and telling me, 'Why destroy public properly? It's there for our benefit, so destroying it only destroys ourselves'. I could identify with Do not only in the physical things (both being Asian and growing up in western Sydney), but also in the non-tangibles, like the instilled gratitude towards our adopted country and the desire to give back. Regardless of whether you can identify with him or not, I guarantee you'll enjoy this book. It's the sort of book I wanted to buy as a gift for everybody I know, but three bookstores I went to had already sold out of them. I'm not surprised. Get your hands on it if you can, however you can. You won't regret it.